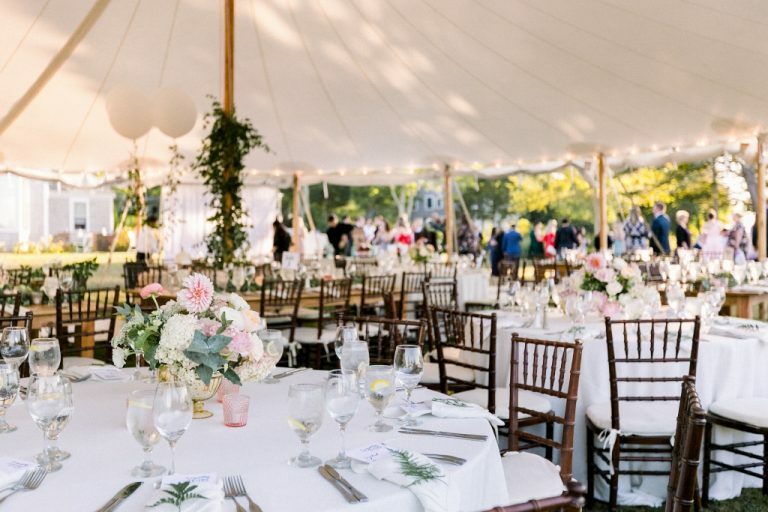 With miles of sandy beaches, world-class hotels and resorts, and countless restaurants, it’s no surprise that Cape Cod has become a top choice for destination weddings. 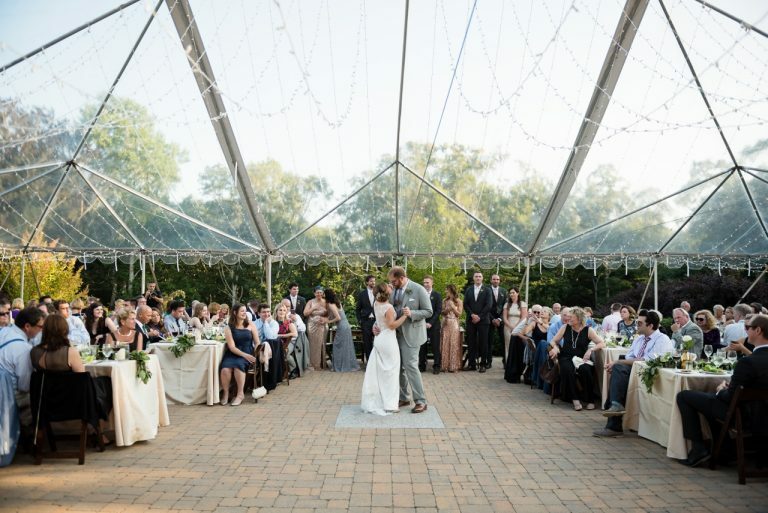 And with our breezy summers and warm autumns, hosting an outdoor wedding on Cape Cod is the preference for many couples. Part of the reason you’ve chosen the Cape for your wedding is because you want to enjoy the gorgeous weather, right? Secure Your Venue Early: If you have your heart set on an outdoor wedding, especially one with an ocean view, plan on confirming your venue at least a year ahead of time. 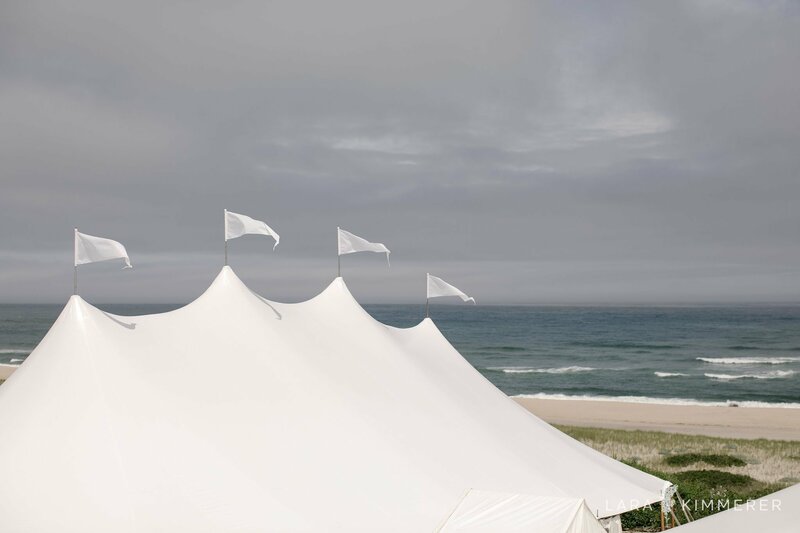 One of our Tidewater Tents at Turntide Estate. Photo by Organic Photography. 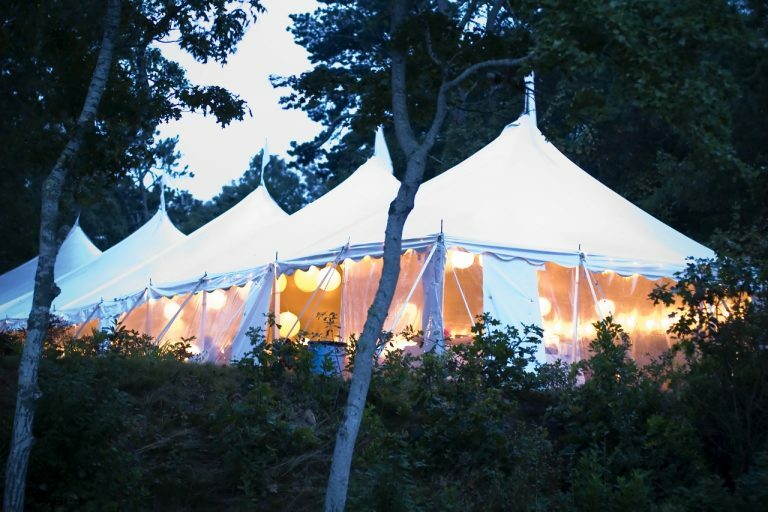 Make Sure Your Venue Can Accommodate a Tent: There are many places here that regularly host outdoor, tented weddings. Some charming options with water views include the Winslow Estate, Turntide Estate, and Mill Pond Estate (to name just a few!). These venues were once private homes, and include multiple bedrooms: perfect for a destination wedding. Our High Peak Frame Tents are a flexible option for challenging sites. When in Doubt, Let Us Scout: For many people who own a second home on the Cape, marrying in the backyard of their summer house is a must. Or perhaps you’re looking at a rental home that doesn’t typically host weddings. In either case, we are happy to arrange a site visit to discuss options. With the variety of tent styles we offer, we can work with virtually any space. 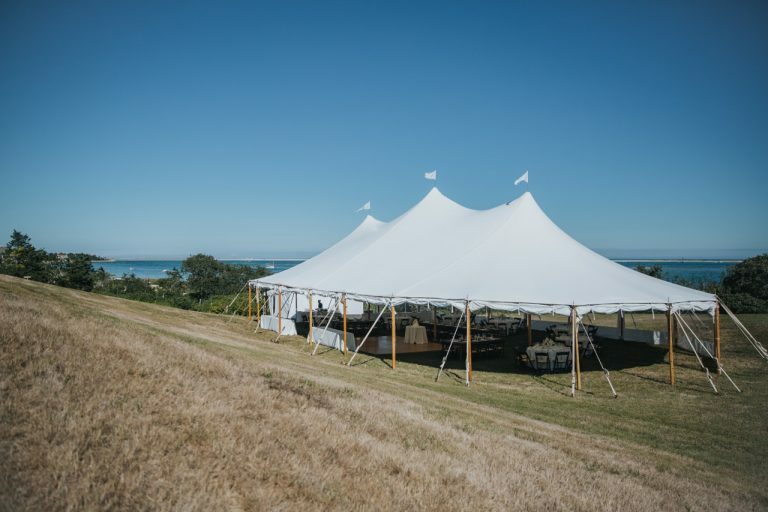 With a little flexibility – allow us to make suggestions on the type of tent and where it should go – we can turn your dream into a beautiful reality. A first dance under one of our Clear Top Tents at Highfield Hall & Gardens. Sarah Murray photo. Be a Good Neighbor: While you want to dance the night away, your neighbors probably have other plans, and some towns have noise ordinances. If you’re planning a backyard wedding in a residential area, consider having the band wrap up by about 10:00 p.m.
Don’t Forget a Dance Floor: Speaking of dancing the night away, do you really want to dance on grass? In heels? Of course not. We have several options for dance floors. Be Mindful of Mother Nature: Not every summer day on Cape is a sunny one, and early autumn cold snaps do happen. Mother Nature is a fickle creature, especially in New England, which is why we offer air conditioners and heaters, and side panels that can be lowered in case of rain. Consider a Kitchen Tent: Should your reception tent be a significant distance away from the kitchen at your home or venue, a “kitchen tent” – a separate, smaller tent for the caterers – works wonders at enhancing service. Caption: A mix of round tables paired with our farmhouse tables is a fun option. Katherine Brackman photo. Have Fun with Furniture Selections: When it comes to choosing the furnishings for your wedding, don’t be afraid to mix things up. Choose a mix of round and rectangular tables, or go with long Tuscan-style tables. We love the look of a blend of linen-clad round tables paired with our farmhouse tables. A few tall, bar-height tables with chairs are a great addition for the cocktail hour. Relax and Have Fun: Above all else, your wedding day should be fun and memorable. Relax and leave the details to the pros and, no, we’re not just talking about ourselves. The experience of the wedding professionals on Cape Cod is unmatched. Trust us on this one. We work with them every day – well, every weekend – and you will be in amazing hands on your big day! Top photo by Lara Kimmerer.